As if we needed more evidence that cephalopods are on the verge of a global uprising that will end in humanity’s destruction, our favorite tentacled invertebrates appear to have an insane visual system that allows them to perceive color despite being technically colorblind. This, along with distributed brains and the ability to bust out of jars from the inside? We’re screwed. The latest fascinating cephalopod insights come to us from a father/son team of researchers at the University of California, Berkeley and Harvard University, who’ve learned that weirdly-shaped pupils may allow cephalopods to distinguish colors differently from any other animals we know of. The discovery is published this week in the Proceedings of the National Academies of Sciences. Boring animals like humans and birds see color using a combination of light-receptive cone cells, each of which contains pigments that are sensitive to a different part of the visual spectrum. It’s only by combining information from different cone cells that colors can be properly distinguished. Hence, when a person lacks a particular type of cone, he’s considered colorblind. Cephalopods only have a single type of light receptor, which means they should not be able to distinguish color at all. And yet, many octopuses, squids and cuttlefish have color-changing skin that’s used for elaborate camouflage ruses and courtship rituals. Clearly, these colorblind animals have become masters of color manipulation. How? The key may lie in those bizarre U-shaped, W-shaped, and dumbbell-shaped pupils, which act like prisms, scattering white light in all directions. This effect, called chromatic aberration, is something round-pupiled animals try to avoid, although you may have experienced it if you’ve ever had your eyes dilated. Instead of focusing light through a narrow pinhole like other animals, cameras, and telescopes, cephalopod pupils blow light out. Once light has been separated into its component wavelengths, cephalopods can use physical tricks—for instance changing the depth of the eyeball, or altering the distance between lens and retina—to focus different wavelengths of light on the retina individually. This allows for colors to be discriminated. 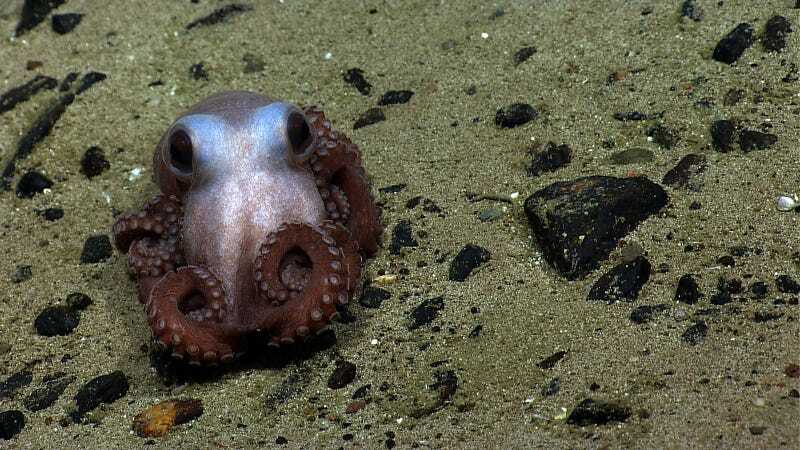 At least, that is a hypothesis now supported by extensive modeling simulations of the cephalopod visual system, which were developed by biology graduate student Alexander Stubbs in collaboration with his father Christopher Stubbs, an astrophysicist. So there you have it: an incredibly intelligent animal, probably with superhuman visual acuity, which is currently multiplying like mad and taking over the oceans. What could possibly go wrong?